Niall King’s Vespa Smallframes site is an oldie but goodie, with tech info and photos of Vespa’s smallframe scooters, and a good amount of info on Asian-market models. It also features a downloadable font “Primavera,” a Mac or Windows version of the 70s Piaggio logo font (sort of a stylized Clarendon Bold Extended, if you’re a type nerd). La Dolce Vita scooter in California? Rocco’s Ristorante and Pizzeria in Walnut Creek, CA claims to have the original Vespa from “La Dolce Vita.” There’s a picture in the slide show, anyone care to speculate on its authenticity? Author illnoisePosted on 31.08.06 31.08.06 Categories Celebrities, History, Vespa3 Comments on La Dolce Vita scooter in California? 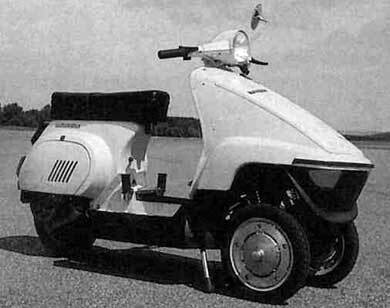 Author illnoisePosted on 02.08.06 02.08.06 Categories History, Piaggio, Vespa6 Comments on The Trautwein-Roller: MP3 in 1984? A few more photos of a model of the new Piaggio Museum designed by Massimiliano Fuksas, on Czech site Arkitera. Here’s our story from May 5. You’ve probably seen most of these, but probably not all in one place: Vespa pin-up girls from the ’50s and ’60s (a culturesponge photoset on flickr.com). More photos from the Piaggio museum, taken when the Giro d’Italia bicycle race passed through town. (check out some photos from the race, too). Thanks, Lu$. 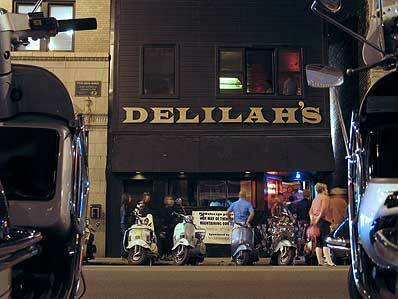 The Allez Cats Reunion at Delilah’s Thursday night was a successful start to the ModChicago weekender, don’t miss the rest of the events. It was neat to see some old “faces,” in person and photos, the music was great, and the booklet the ACSC put together is a fantastic reminder of the era before the internet and twist-and-gos changed scootering forever. 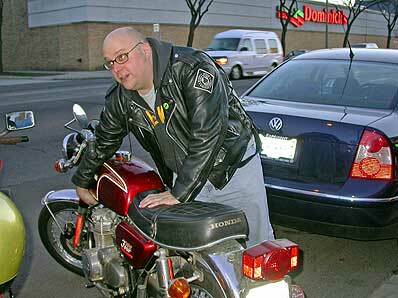 Sun-Times music critic and author Jim DeRogatis was there, so look for a story tomorrow. MODchicago‘s annual “Our Way Of Thinking” festival of Modness is coming up next weekend. OWOT is always a good time, but this year they’ve stepped it up a few notches with more scooter-related events and a special scooter section on their website. Best of all, the event has spawned the new Mayday Scooter Club and the reunion (Thursday, June 1 at Delilahs) of the Allez Cats Scooter Club, one of Chicago’s big clubs of the 80s and early 90s. 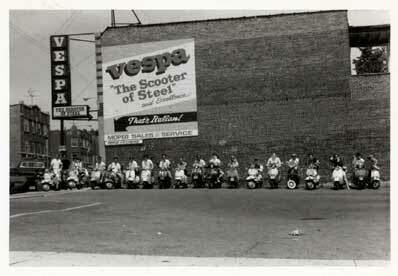 The site also features an archive of ACSC memorabilia including Mike Park’s photo (above) of the club in front of the old Vespa of Chicago on Clark Street (which closed just a month or two before I got my first scooter). OWOT also features a party at Design Within Reach’s Evanston store and a tour of the Chess Records studio. 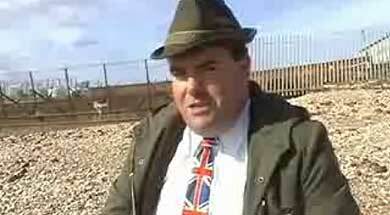 Whether you love or hate Mods (no comment! ), next weekend should be a blast for everyone. 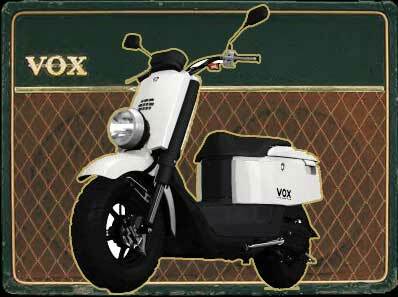 As we suspected the other day, the Yamaha VOX scooter is actually on the market in Japan, with a fun flash site to promote it (if you read Japanese). Now Japanese mods (don’t laugh, you wouldn’t believe how many Japanese mods there are) are surely torn between vintage scooters and a spiffy retro scooter bearing a brand name synonymous with the British Invasion. (I suspect they’ll stick with vintage). The story of Japanese musical instruments roughly follows the development of their motorcycles: Japanese products that started life as cheap knockoffs (are you listening, China?) eventually surpassed many Western instruments in quality and features, at a much lower price, and eventually dominated the market and put the original makers out of business (are you listening, corporations?). So it’s a bit funny to learn Vox’s parent company, Korg, is owned in part by Yamaha, and they’re leveraging the brand name to sell scooters. 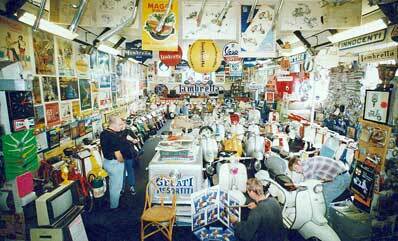 The Weston Mercury reports that respected British Lambretta collector Nigel Cox, author of “Lambretta: An Illustrated History” and proprietor of Weston Scooter Parts in Weston-Super-Mare, England, is selling his famous Lambretta museum. Cox estimates the collection is worth Â£500,000 and hopes to sell it all for Â£350,000. The article says Americans and “a British consortium of enthusiasts” have placed bids for the museum, which has been open to the public for nearly 20 years. It’s unclear whether Cox, 55, will also close his spares business, which has long been famous as the only source for many original Lambretta parts and accessories, but he does plan to keep his two most prized scooters, the very first and very last Lambrettas ever made. At the recent Vespa 60th Anniversary celebration, Piaggio president Roberto Colaninno and Italian architect Massimiliano Fuksas unveiled a model for an exciting new Piaggio Museum. Colaninno called the new museum “the great plan of a great architect,” a 60th-anniversary “gift” for the Vespa. Fuksas is famous for his painterly approach to architecture and his skill in using existing structures to compliment his designs. The new museum is a perfect example, two layers of red polymer clouds will hover within Piaggio’s expansive Pontedera factory, containing the museum, archives, and a coffee lounge, giving visitors a panoramic view of the assembly lines below. The swooping bubbles of the museum emulate the curvy design of the Vespa (is that an ET4 headlight above?) and hopefully the museum’s function will equal its form, like the vehicle it celebrates. Fuksas is also famous for keeping a reasonable budget and tight schedule, and again, this project fits the profile– announced on April 27, the museum is expected to be completed in 2007. His other recent high-profile projects include Ferarri’s headquarters in Maranello and the EUR-district Congress Center in Rome. It seems like Vespa’s 50th anniversary was just last month! Can you believe the ET-series is already ten years old? Coverage of the Italian festivities, with all the usual cliches, ran today on Times Online: “Cool at any age: The Vespa hits 60” Note: That’s 60 years old, not 60 mph. 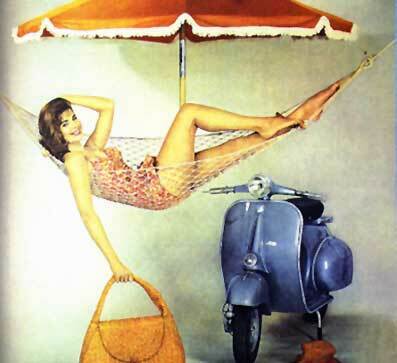 Author illnoisePosted on 18.04.06 18.04.06 Categories History, Vespa6 Comments on 60 already?